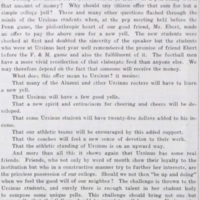 This is a project that focuses on the history of Ursinus College during the 1920s and the early 1930s; aimed at showing how the student body reacted and responded to the sudden shift from the exuberence and wealth that defined the Roaring Twenties to the extreme poverty and immense misery that came to define the Great Depression. Our project's name pays homage to Irving Berlin's 1926 hit song "Blue Skies," which became symbolic of the jubilance, optimism, and care free nature of the 1920s. Our title, "No More Blue Skies," hints at the irony of the world depicted in the song, for everything it would come crashing down only three years after the song's release in 1926 with the Stock Market Crash of 1929. We hope this project will become a catalyst for further study into Urinus' formative years. A special shout out to Andy Prock and Caroline Weigel, whose help proved crucial in the development of this project. This was a project for Bears Make History, completed in 2017. Ursinus is a respected liberal arts campus, featuring an egalitarian core that’s showcased through curriculum and student attitudes. At its foundation, Ursinus was notoriously religious and all male. Under the service of dedicated presidents, the campus began to shift quickly over time into the respected liberal space it’s today. Presidents are memorable figures in history, usually evoking change and progress during their term. 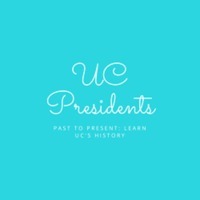 Therefore, our group Memorable UC Presidents plans to conduct a comprehensive history of the presidents from Ursinus’s foundation to present day. There are presently 17 Ursinus presidents. For linguistic purposes, we’re featuring only 5 presidents in our project. In a biographical style, we plan to detail the lives and accomplishments of each selected president during their administrations at Ursinus. Our main objective is to present a full representation of Ursinus through a study of the president’s impacts in shaping our campus into a liberal space. We will be presenting on John Bomberger, the founder and first president, as well as Leslie Omwake, Richard Richter, and John Strassburger. For each president, we will be focusing on different themes such as physical changes on campus, gender policies, and curriculum changes. We hope that our project will help both students and faculty understand how the Ursinus campus they live on today was shaped by these influential presidents.